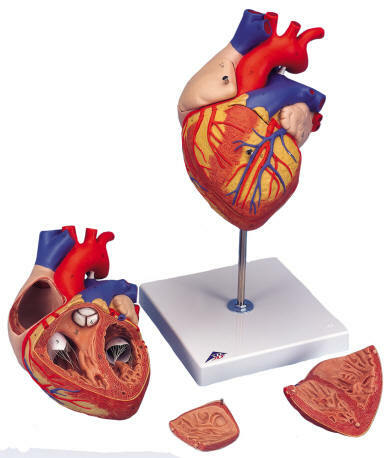 This twice life-size human heart model allows very easy identification of all structures and is the perfect anatomical teaching aid for lessons in big classrooms or lecture halls. 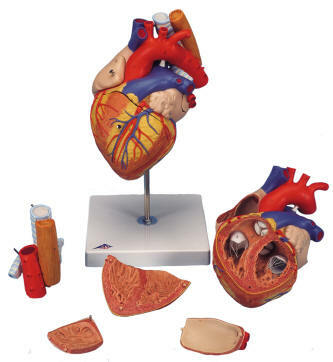 The atrium wall and the front heart wall are removable to reveal one of the most professionally detailed and realistic heart models available. Hand-painted in lifelike colors to depict dozens of items of anatomical interest. Delivered on removable stand. 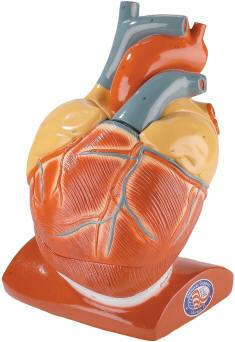 This twice life-size anatomical model of the human heart is great help for teaching heart bypass surgery. The front heart wall can be removed to view the inner chambers of the human heart. In addition to the anatomy of the heart, this model shows a venal bypass to the ramus postero-lateralis of the right coronary artery, to the ramus interventricularis of the left coronary artery with branching to the ramus diagonalis as well a bypass to the ramus circumflexus of the left coronary artery. 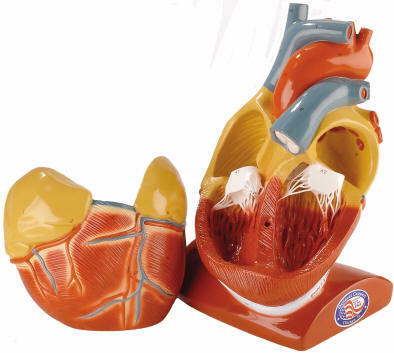 This anatomical model of the human heart is twice life-size. It has the same features as the 4-Part Heart listed above but also shows the upper section of the esophagus, the upper branch and the ascending aorta. The front heart wall and the atrium walls can be removed. Comes with stand. 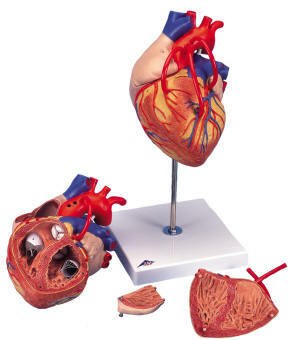 The large size of this human heart model makes it ideal for group study. It separates into two parts, making it easy to trace blood flow through the chambers, valves and vessels. 59 features are number coded and identified in an accompanying key including: the coronary arteries, circumflex artery, coronary veins and coronary sinus, segments of the esophagus and trachea, lower portion of the pericardium, diaphragm section, flexile tricuspid value, pulmonary valve, mitral valve and aortic valve. Overall dimensions 7" x 5." NOTE: This is a hand-made model, made to order. Please allow 4 weeks for delivery.